In early January, a group affiliated with the House GOP launched a $1 million ad campaign for a health-care bill that didn’t exist. The 30-second spot featured a montage of ethnically diverse (but uniformly telegenic) American families spending quality time together, as a friendly female voice outlined the Republican Party’s core goals for health-care reform. The commercial never explained how the plan would accomplish these goals. Instead, it invited interested viewers to go to ABetterHealthCarePlan.com for more details. But that website merely offered visitors the chance to watch the commercial again — and to type their names and email addresses into a form. There was no bill, nor even a summary of one, because “A Better Health Care Plan” had yet to be written. And it never would be. On Monday, the Congressional Budget Office released its analysis of the House GOP’s Obamacare replacement — and confirmed that it bears little resemblance to the bill that the party has been promising for nearly eight years. Per the CBO’s estimates, the American Health Care Act (AHCA) will cause 24 million people to lose coverage by 2026, a decline fueled by cuts to Medicaid and a radical increase in the cost of insurance for low-income, elderly people — especially those in rural areas (who tend to vote Republican). (1) The CBO cannot be trusted to fairly score conservative proposals. (2) The CBO’s numbers are worthless because they don’t factor in the effects of parts two and three of the GOP’s health-care-reform plan. (3) The CBO report is actually good. The first argument is a bit odd, considering that the current CBO head is a conservative economist handpicked by Trump’s Health Secretary Tom Price. The second argument is even more disingenuous. The GOP’s second and third health-care bills haven’t been scored because they haven’t been written. And they haven’t been written because they’re comprised of regulatory reforms that would require eight Democratic votes to clear the Senate — and the GOP knows it can’t get those votes. What’s more, even if Republicans could push their desired regulations, there is no reason to think the insurance rate would be significantly affected. The AHCA cuts subsidies to the poor and the old. Allowing insurers to sell across state lines is not going to make health care affordable for low-income people who lose their access to Medicaid. The third argument is the most honest, but, in a sense, the most shocking. Here’s Paul Ryan making the case in his official response to the CBO’s findings. This report confirms that the American Health Care Act will lower premiums and improve access to quality, affordable care. CBO also finds that this legislation will provide massive tax relief, dramatically reduce the deficit, and make the most fundamental entitlement reform in more than a generation. But the second sentence is entirely true. The bill gives the wealthiest people in America a $599 billion tax break. But it also slashes $935 billion in health-care subsidies. 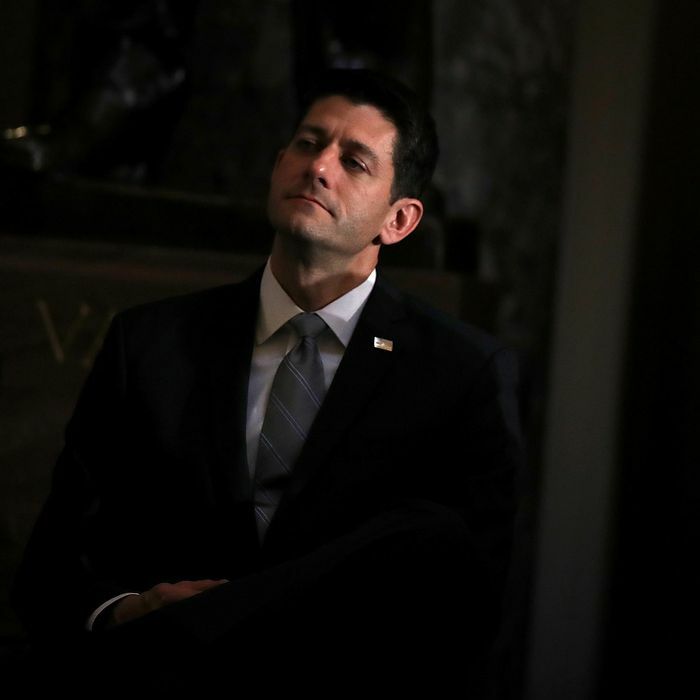 So, Paul Ryan’s bill provides genuine “relief” to multimillionaires struggling to finance their second boats, while still cutting the deficit (on the backs of the working poor). This argument is remarkable for at least two reasons: First, the premium reductions that the CBO projects are the direct result of fewer old people being able to afford insurance. (The fewer expensive old people your insurer covers, the better deal it can cut you — until you become an expensive old person, anyway). Touting these premium reductions is akin to championing a plan to cut Social Security costs by reducing the number of Americans who survive long enough to retire (which, as it happens, is another thing the AHCA appears to do). Second, and more fundamentally: The words tax relief, deficit reduction, and entitlement reform were never spoken in the party’s early-January advertisement. And for good reason: The GOP’s primary critique of Obamacare has never been that it cost the rich too much money. The following week, the president echoed the argument that the big problem with Obamacare is that it isn’t generous enough. White House press secretary Sean Spicer told reporters last week, “When we get asked the question, ‘How many people are going to get covered?’ that’s not the question that should be asked.” Pressed on the merits of the bill by George Stephanopoulos on ABC’s This Week, Office of Management and Budget director Mick Mulvaney shot back, “You’re worried about getting people covered.” As if that’s a woeful mistake. In celebrating the fact that its bill cuts taxes on the rich and reduces the deficit — while minimizing the significance of millions losing their insurance coverage — the Republican Party is all but admitting that it has been lying about its priorities on health-care policy for nearly a decade. Imagine if the Republican Party had been honest about its vision for an Obamacare replacement. Imagine if the GOP had explained that its “new path forward” would provide lower taxes for the rich and more affordable health insurance for 21-year-olds who make $68,000 a year — while pricing 24 million (disproportionately elderly, rural) Americans out of the health-care market, and, thus, saving those who can still afford insurance 10 percent on their premiums, one decade from now. What would Obamacare’s approval rating have looked like, if Americans always knew that this was the alternative? How many electoral votes would working-class, rural voters have delivered to the GOP in 2016?